Legendary Elvis Costello and The Attractions / The Imposters keyboardist Steve Nieve has signed with 429 Records and is gearing up for the release October 8th of "ToGetHer" - a dynamic collection of original songs featuring collaborations with a long line of noted artists including Sting, Costello, Laurie Anderson, Glenn Tillbrook, Robert Wyatt, Ron Sexsmith, Vanessa Paradis, Harper Simon (son of Paul), Joe Sumner (son of Sting) and French talents Tall Ulyss, Cali, Alain Chamfort and Muriel Teodori (Nieve's life partner). The British born musician now residing in Paris has composed a thrilling collection of songs in a pop/ rock vein incorporating a heady mix of experimental, theatrical, classical and French styles. Produced and written with Teodori (with whom he composed the 2007 classical opera "Welcome to the Voice") and French musician Tall Ulyss (front man of the popular rock group Tall Ulysses), and with the help of musicians Vincent Segal (cello), Francois Poggio (electric guitar) and Benoit de Segonzac (bass), Nieve has crafted an evocative song cycle that's both a contemporary musical statement and an ode to his adopted home of France. Notably, Nieve and Costello collaborated on their duet "Tender Moment (Kairos)" (lyrics and music by Nieve with Costello on vocals) and "You Lie Sweetly" (Lyrics by Costello, music composed by Nieve with Sting contributing vocals). "ToGetHer" will be released on 429 Records October 8th. 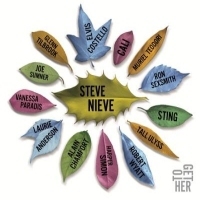 Inducted into the Rock Hall of Fame as a member of The Attractions, Steve Nieve has spent the last 36 years performing with Elvis Costello and releasing his own solo work. A departure from his former solo releases which showcased the classical and minimalist side of his craft, "ToGetHer" is a fully fledged pop rock manifesto masterfully utilizing the talents of artists he has known and respected through the years and who help him realize his unique musical vision outside of his comfort zone. Says Nieve: "I truly love what we have created with ToGetHer, and the thing I enjoyed the most was hearing the songs finally come to life, each time - all these strong, clear, beautiful voices coming together to help me share and give rise to my vision," he adds. "I am so blessed to have so many great musical friends who could be part of this journey to create what is, in essence, a true chorale album."